Britain said it would tax the revenue that online platforms such as Google, Facebook and Amazon make in the country to update a system that had not kept pace with changing digital business models. "It's clearly not sustainable, or fair, that digital platform businesses can generate substantial value in the U.K. without paying tax here in respect of that business," finance minister Philip Hammond said in his annual budget speech on Monday. The Treasury said profitable companies would be taxed at 2 per cent on the money they make from U.K. users from April 2020, and the measure was expected to raise more than £400 million pounds ($672 million Cdn) a year. The tax will target platforms such as search engines, social media and online marketplaces, Hammond said, and it will be paid by companies that generate at least £500 million ($840 million) a year in global revenue. Companies typically pay their taxes where they are based. But while local governments can impose a sales tax on physical goods in shops and restaurants, that has not been the case with online service providers. And in the European Union, foreign companies like Amazon, Google and Facebook pay what tax they owe in the country where they have their regional base — usually a low tax haven like Ireland. So their business generates little to no tax revenue in countries, like the U.K., where they have significant operations. Britain had been leading attempts to reform international corporate tax systems, Hammond said, but progress had been painfully slow and governments could not simply talk forever. The EU has said it wants a digital tax and the idea has also been floated in Canada, but is unpopular. Clifford Chance tax partner Dan Neidle said the radical nature of the proposal clearly showed that Britain was becoming frustrated with the slow pace of change in global tax laws. "The U.K. is running ahead of every other country except Spain," he said. But given the dominance of U.S. tech giants, President Donald Trump's administration may not appreciate the proposal at a time when Britain is trying to agree new trade deals. Hammond said that if a global solution emerges, it would consider adopting this instead of its tax. But in the meantime, the government would consult on the detail to make sure it got this right, and then ensure Britain remained one of the best places to start and scale up a tech business. The announcement came as Hammond splashed out on health services in a spending plan signalling the easing of eight years of austerity with a modest uplift in public spending and few major tax increases. 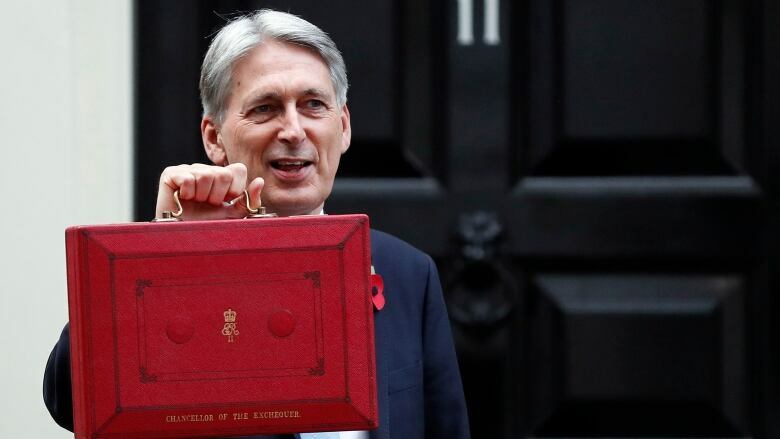 Hammond declared the end is in sight for the budget cuts implemented by a series of Conservative-led governments after the global financial crisis, reiterating a commitment made by Prime Minister Theresa May this month. But he cautioned that the government's plans to end austerity could be thrown off track if Britain fails to secure a deal that protects trade with the EU.